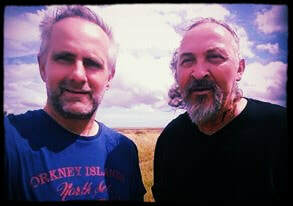 Peter Ashby and Barry Lamb first recorded together in 1976 as teenagers. They became part of a vibrant and immediate cassette culture movement releasing their own diy tapes initially under the name of Frenzid Melon. Their unique brand of edgy, punk influenced art rock has proved popular with cassette culture collectors all around the globe. Ashby had a brief excursion into the 4ad recorded Spasmodic Caress whilst Lamb focused on his own brand of experimental music using rudimentary tape loops and sound manipulation. They came together again in the early to mid 80's forming the insane picnic who touched the outer echelons of the indie chart and grabbed the attention of John Peel. Further collaborations and projects have taken place through the subsequent decades in working together on each others solo recordings, an obscure private pressing album under the name Ermin Grud, working on ad hoc projects including collaborations with Keith Levene (ex-PiL), Jasun Martz (Frank Zappa, Michael Jackson), Wavis O'Shave, Tor Cesay aka Isatta Sheriff (Mongrel, Flying Lotus, Lizzie Ball) and countless others.